There’s nothing wrong with its standard set up which has an unsuspecting family haunted by spirits. However, when it comes time for the film to follow through on the plotline, we find out the filmmakers weren’t quite up to the task. It begins, as these films often do, with a family moving into a new house. There’s Josh (Patrick Wilson), his wife Renai (Rose Byrne), their two young boy, Dalton (Ty Simpkins) and Foster (Andrew Astor), as well as a baby. One night, Dalton is exploring the attic, falls off a ladder, and not long after, slips into what appears to be a coma. However, after a visit to a hospital, the doctors can’t find any explanation for his condition. A few months pass with no changes in Dalton’s condition. This is when Renai begins to hear and witness strange things such as unusual sounds coming through the monitor in the baby’s room and even catching a glimpse of an unknown figure standing in the room. After several occurrences like this, Renai wants to move, thinking that it is the house that is haunted. Seeing what a desperate state his wife is in, Josh agrees, causing the family to move to another house. However, when the occurrences begin happening again, they begin to suspect that their problems won’t go away that easily. The film starts off rather slow, but that’s to be expected so that it can set up the characters and the situation. We get small hints of scares to come as the incidents start to happen, such as those with the baby monitor and strange figures appearing. Then, as the film progresses, these turn into larger incidents, all of which are accompanied by a loud, sharp stab on the musical soundtrack just to make sure you know that it’s a scary moment happening, or in the case of some horror films, to make sure you’re awake. Luckily, that part about staying awake doesn’t really come into play much in this movie, at least, not until the film hits the third act. For the first two, director James Wan and writer Leigh Whannell (both known for “Saw”) put together a film with an interesting mystery and some decent “surprise moments” to go along with it. It’s somewhere in the second act, amidst a strange comical interlude involving two paranormal investigators (Whannell and Angus Sampson) that a psychic (Lin Shaye) is brought in to see if she can help the situation. It is here that we learn the truth about what’s really happening with Dalton and it’s here where one of a few things can happen. You can laugh, roll your eyes, or just go with it. For me, it was kind of a mixture of all three. As it heads into the third act, the film slows way down for a rescue attempt that involves furthering the silly truth of the mystery surrounding Dalton’s condition. This involves a showdown with a demon that has the figure and speech skills of the aliens from “Signs,” as well as a face resembling that of Darth Maul from the first episode of the Star Wars saga. This all comes down to a twist ending that works alright for the film, but it would have been better if the audience didn’t have to trudge through the dull majority of the third act to get there. 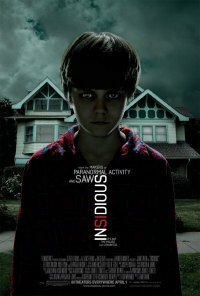 If all you’re looking for is something to give you a few thrills and chills (that is, if you scare from surprise moments easily) regardless of plot issues and pacing, then “Insidious” will probably suit you just fine. Most people who go to see movies like this tend not to be overly-critical of the details. All they want is to have a little fun being scared while jumping in their seats, which “Insidious” is more than happy to make them do. 2.5/4 stars.